The information on this page is from 2018. ​Audition information for 2019 will be posted at a later date. We will be holding auditions Monday, beginning at 12:30, after our first day of camp. This is one day earlier than we have done in the past due to our desire to give campers as much time as possible to learn their lines and perfect their acts. For the characters above, the lines and song clips are available below. You may audition for no more than 2 roles. We would prefer that you have the material memorized, but that is not required for the audition. Your audition can be no longer than 2 minutes. Your act needs to fit the time period and culture we are studying. If your act is music, you must know the composer and the date it was written, which must be before the 1930s. You must have the sheet music for the accompanist on Audition Day and she must be able to keep this music until the conclusion of camp. There can be NO recorded music. This will automatically disqualify you on the day of auditions. Your audition will be heard/seen by the entire staff. Results will be announced on Tuesday, so that those who are chosen will have ample time to perfect their acts. BOB HOPE: Good evening ladies and gentlemen. Yes, it’s me, your Master of Ceremonies for tonight, Bob Hope. And what an amazing show we’ve got for you this evening. 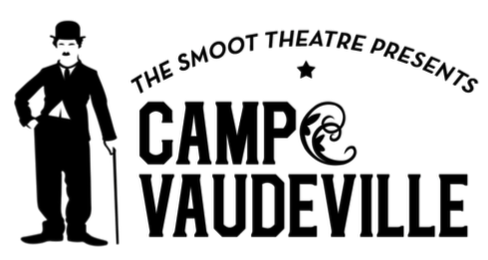 We’ve brought together some of the very best performers who all got their start in Vaudeville. But another thing about the acts you will see tonight. These performers all came to America as immigrants when they were young kids, or they were born soon after their parents immigrated here. You know, I was born in England in 1903 and we came to America when I was four. We were so poor I wore hand me downs all my life. By the time the trousers got to me, they were so worn that I could sit on a dime and tell you if it was heads or tails. And by the time my younger brother got them, he could do the same thing sitting on a dollar bill. In all there were seven brothers. That’s how I learned to dance…waiting for my turn in the bathroom. So, let’s get this show started with a great lady - One of the most popular entertainers during the first half of the 20th Century. Here she is – “The Last of the Red Hot Mamas” - Miss Sophie Tucker. SOPHIE TUCKER: Hello everybody. Let me tell you a little bit about myself. I was born as my Jewish family was on route to America from the Russian Empire of Ukraine in 1887. The family settled in Hartford, Connecticut, and opened a restaurant there. At a young age I began singing there for tips. Between taking orders and serving customers, I would stand up in the narrow space by the door and sing with all the drama I could put into it. At the end of the last chorus, between me and the onions there wasn’t a dry eye in the place. JIMMY DURANTE: Hello folks! Well, here it is - the old schnoz. Yes, it’s real! It ain’t gonna bite you, and it ain’t gonna fall off! You know, I got my nose from my mother, a piano from my father and a taste for indoor plumbing from the joint where we lived when I as a kid. That’s cause the bathroom was out in in da backyard. (Laughs) That was down on the Lower East Side of New York City where I was born in 1893. See, my parents were immigrants from Salerno, Italy. I dropped out of school in seventh grade to become a full time ragtime pianist. They called me “Ragtime Jimmy”. And by 1920 I had my own Jazz Band. A few years later I joined up with Lou Clayton and Eddie Jackson and we became Vaudeville stars headlining the Palace for $3,000 a week and breaking box office records. And believe me that was a lot of money in those days. We sang and acted crazy. I told jokes: They’d tell me they had just listened to music from an operetta. And I say: ”An operetta? Why, that ain’t music. That’s the dame who works for the phone company.” Get it? (Laughs) I got a million of ‘em! A million of ‘em. When I finally went out on my own, I introduced this song that became a hit record and stayed with me my whole a career. GRACIE: My, the department stores were crowded today. I went to the exchange desk and the girl was out to lunch. So we all had to wait in line. And I was number seven. GRACIE: Uh, huh. So I ask the lady in front of me what she was exchanging. And she said she had to return these shoes for her children - because they were too tight. And I said shame on you for allowing your children to drink. GRACIE: Uh, huh. And the line moved up and I was number six. GEORGE: Oh, the girl came back from lunch. GEORGE: I should have known that. GRACIE: And then the man in front of me – he looked so peculiar. He had a lot of hair on the side of his head but nothing on the top. So I said to him, I said: Boy, you must have grown fast as a child. You grew yourself right through your hair. GEORGE: Uh, that was a nice way to break the ice. GRACIE: Uh, huh. And then I was fifth. GEORGE: And moving up fast. GRACIE: Yes. And then there was this lady and her husband ahead of us. So I said to this woman, I said: I hope this girl comes back from lunch soon. And she said: So do I. I have to make an exchange for my husband. His hat’s too small. GRACIE: I said why exchange your husband. Why not get him a larger hat. NORA BAYES: You know I was also born to immigrant parents. They came here from Germany in 1880. They were very strict, but I longed to be in show business, So I ran away from home when I was a teenager to become a performer and started touring on the B. F. Keith Vaudeville circuit all over the country. BOB HOPE: And became one of the biggest celebrities in the United States. NORA BAYES: Bob, I loved singing my heart out in Vaudeville. It was great to meet so many people all over the country. BOB HOPE: Ah, yes, I’ll never forget those one-night stands when I was in Vaudeville, going from town to town. Always on the go…and they never caught me either. Everyone who saw my act told me I’d go far… The manager of the theatre told me I’d go far… Not only that…he stood out in the road and pointed. NORA BAYES: Oh, Bob… Luckily I never had that problem. I moved right on up to the Ziegfeld Follies and even had my own theatre named after me in New York City. Did you know I sang there accompanied by a 19 year old kid who was trying to break into show business? His name was George Gershwin. FRED: Hi, Bob. You know our father, Fritz, emigrated from Austria and moved to the Midwest to become a brewer. ADELE: He married mama soon after arriving there and then I was born. Fred happened three years later. I was already taking dance lessons when Fred started walking. ADELE: Yes, I guess we both seemed to be natural born dancers, and mama dreamed of escaping to bigger and better things. FRED: So we all moved to New York City and soon we were in Vaudeville. EDDIE CANTOR: My parents were Russian Jewish immigrants, but they both died when I was very young. So I was raised by my Grandmother. BOB HOPE: Where did you live? EDDIE CANTOR: Where all the fashionable people lived: In a basement apartment on Henry Street on the Lower East Side of New York. Thanks to a youth program I was sent away to a summer camp. I’d never seen so much green before that wasn’t on a pool table. BOB HOPE: So how did that lead to show business? EDDIE CANTOR: Well, a bunch of us boys started singing together around the campfire and decided that we were pretty good, so when we got back we auditioned for Gus Edwards and he started us out in Vaudeville. I’ve been poor and I’ve been rich. And, believe me, rich is better! So, when Florenz Ziegfeld asked me to be in his Follies, I told him: “A verbal agreement isn’t worth the paper it’s written on.” But once I signed that contract I went on to star in six editions of the Ziegfeld Follies from 1911 to 1923. I gave them what they wanted. I knew that an audience will never take you home because of your tears but because of your laughter. And that’s what I was, a Funny Girl! And, boy, could I put over a song. So, here’s one of my favorites. You’re gonna love it! Take it away, Marsha! DAISY: Hi! I’m Daisy Hilton. DAISY: And we are conjoined twins. VIOLET: Connected together at the hip at birth. DAISY: We were born in Brighton, England in 1908 and from the age of three began touring Europe - mostly as a side show attraction. VIOLET: But when we were eight we came to America and started performing in Vaudeville. DAISY: We were billed simply as the Hilton Sisters. We played musical instruments and sang and danced. VIOLET: I bet you don’t know that Bob Hope’s first job in show business was as a dancer in Fatty Arbuckle’s Vaudeville show in 1924 on a double bill with us! DAISY: That’s right. He and his partner would dance with us. Their act was called the Dancemedians. DAISY: I also bet you don’t know that we once appeared on a Vaudeville bill right here at the Smoot Theatre. How about that? VIOLET: And coming up next is one of our favorite songs. DAISY: Well, of course we love it. It’s all about us! GROUCHO: I just remembered. I came back here looking for somebody. You don’t know who it is, do you? CHICO: It’s a funny thing, it just slipped my mind. GROUCHO: Oh, I know, I know - the greatest tenor in the world. CHICO: Well, I’m his manager. CHICO: What do you care? I can’t pronounce it. How much you pay him? GROUCHO: Well, I don’t know. Let’s see – a thousand dollars a night... I’m entitled to a small profit... How about ten dollars a night? CHICO: Ten – ten dollars! I’ll take it. GROUCHO: All right, but remember, I get ten percent for negotiating the deal. CHICO: Yes, and I get ten percent for being the manager. How much does that leave? GROUCHO: Well, that leaves him – uh - eight dollars. CHICO: Eight dollars, eh? Well, he sends five dollars home to his mother. GROUCHO: Well, that leaves three dollars. CHICO: Three dollars. Can he live in New York on three dollars? GROUCHO: Like a prince. Of course, he won’t be able to eat, but he can live like a prince. However, out of that three dollars, you know, he’ll have to pay an income tax. CHICO: Oh, his income tax, eh? GROUCHO: Yes. You know, there’s a Federal tax and a State tax and a City tax and a Street tax and a Sewer tax. CHICO: How much does that come to? GROUCHO: Well, I figure if he doesn’t sing too often he can break even. CHICO: All right, we take it.